Your supporters’ fundraising pages can make or break your peer-to-peer fundraising success. These pages are the channels through which your organization can garner donations and tap new networks of supporters. They also give your supporters a platform to share their personal connections to your cause. In short, the personal fundraising page is one of the most important components of your peer-to-peer campaigns. Because these individual pages are so integral to your success, they need to be optimized for engagement. By presenting a clean page layout with the right features, you can increase the chance of having others donate to the page, as well as keep your fundraiser excited and motivated to reach his or her fundraising goal. Here are five ways you can improve your personal fundraising pages to better engage your fundraisers and their networks. Highlighting real-time progress not only shows your organization’s commitment to transparency, it also validates your cause in the eyes of new supporters. Implementing a live feed or progress bar is not just for your main campaign pages though. It’s just as important to display on supporters’ personal fundraising pages. Progress bars are great motivators for fundraisers—they will be more inclined to boost their efforts when they can see the finish line inching closer and closer. 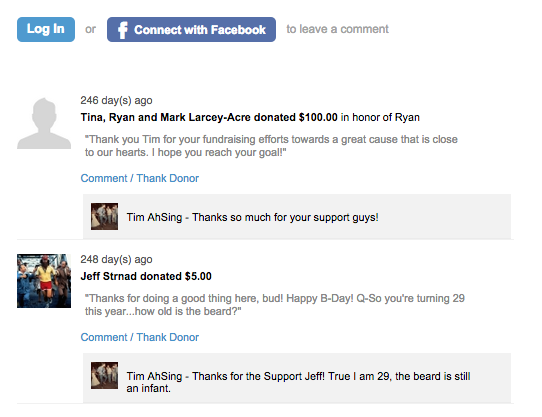 At the same time, displaying progress on a personal fundraising page can motivate others to get involved, too. As an individual fundraiser makes progress toward his or her fundraising goal, people become more willing to contribute and help drive the campaign to success. 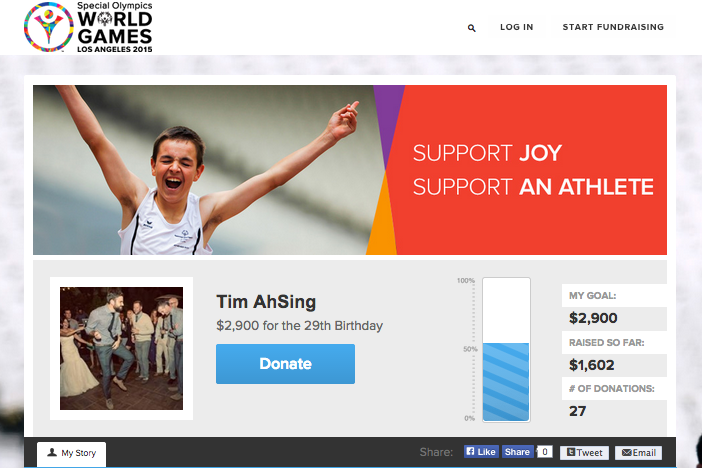 On Classy, each personal fundraising page displays a live progress bar for that campaign. Every time a donation is made, the progress bar and donation numbers update in real time, allowing the fundraiser—as well as his or her network—to keep a pulse on the impact they are making. Social fundraising is powerful because it allows you to quickly reach lots of people through popular online channels. It should be easy for your fundraisers, then, to spread the word about their personal fundraising campaigns to their friends and family. Make sure to implement share features on your personal fundraising pages. The Share section on a Classy personal fundraising page makes it easy for supporters and their networks to promote a campaign, either by “liking” or sharing it to Facebook, tweeting it, or sending an email straight from the page. Including these share buttons can go a long way in helping your fundraisers get the word out to their networks and, consequently, hitting their fundraising goals. A large part of what makes peer-to-peer fundraising so appealing is that it empowers supporters to individualize the causes they support. They get to connect their own beliefs, values, and experiences to your mission, and their personal fundraising pages serve as vehicles to directly share their own story. This means that fundraisers should have ample opportunity to express themselves through the main content on their page. A personal fundraising page on Classy allows supporters to add personal images or video to the Media Section, which can display up to five pieces of content. This gives your organization space to upload one or two main campaign videos or photos across supporters’ pages, while leaving room for your fundraisers to upload a few of their own. They can also customize the main copy on the page to express, in their own words, why this cause is important to them. While supporters love the ability to individualize their connection to your cause, it’s equally important for them to know they’re part of a larger community with a shared purpose. People want to feel like they are part of a greater movement, and it’s up to your organization to show them that they are. Use your supporters’ personal fundraising pages as windows into the larger peer-to-peer fundraising community that has rallied around your cause. 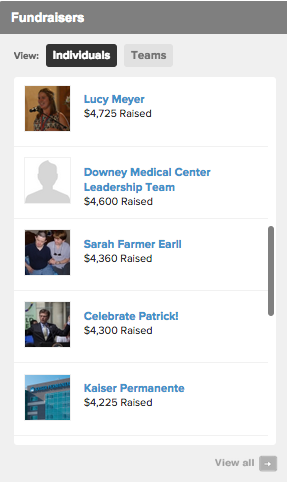 One way to do this is by displaying a leaderboard of top fundraisers right on the page. With Classy, this real-time feed comes built into your supporter’s personal fundraising page, making it easy for both fundraisers and their networks to see who else is participating in your campaign. And, if your campaign allows team fundraising, a list of top fundraising teams also pops up. This running list can help foster some friendly competition among groups of supporters. Displaying your fundraising community also provides social reinforcement for your organization and its mission. People are often more willing to get involved when they see others have already validated your cause. These leaderboards can increase the visibility of your social proof to recruit new support for your organization. Your fundraisers will hopefully receive tons of donations on their pages. Take this activity a step further by making it public. Heighten the sense of community around your cause and mission by implementing a live activity feed on personal fundraising pages. Each time someone donates to a personal fundraising page on Classy, his or her contribution and personal message get recorded on the public Activity Wall. Showcasing these donations can also serve as social proof for the campaign, encouraging sidelined supporters to join in and make a contribution too. Another cool thing about the Activity Wall is that it enables fundraisers to engage with their networks, straight from their page. Fundraisers can comment on people’s donations on the feed, so they can thank donors immediately and strengthen those personal connections. These notifications are also automatically emailed to donors to ensure they don’t miss anything. Your organization can also comment on individuals’ activity walls. This can help humanize your brand in the eyes of third-party donors. These donors may only be giving because of their personal relationship with the fundraiser, but commenting on their activity can leave a good impression of your organization’s personal outreach. 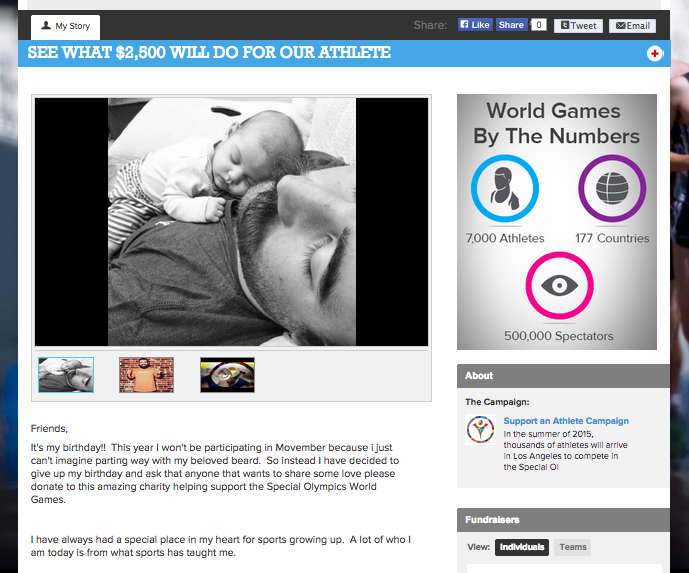 Personal fundraising pages have a ton of potential to foster engagement. Optimizing their layout and features is a key step in helping your fundraisers reach their goals and engage their networks. By making sure these pages show fundraising progress, your supporter’s story, and your larger fundraising community, you can help set your fundraisers up for success—which, consequently, sets you up for success.